So what do you do when you end up with an awesome handset but with a dead operating system? Well you port a very much alive mobile OS to it. The Nokia N9 is running the now defunct MeeGo, which was abandoned by the Linux Foundation in favor of the HTML 5 Tizen. Owners of the polycarbonate body beauty should not despair just yet, developers are at at work, and they’ve already managed to create a pretty solid port of Android 4.0 Ice Cream Sandwich for the device. News of Project Mayhem, as it’s called, broke a few weeks ago when the first images of a Nokia N9 running Android ICS appeared, but now a developer has released the first Alpha version of the port, which anyone can download and try-out — at their own risk of course. 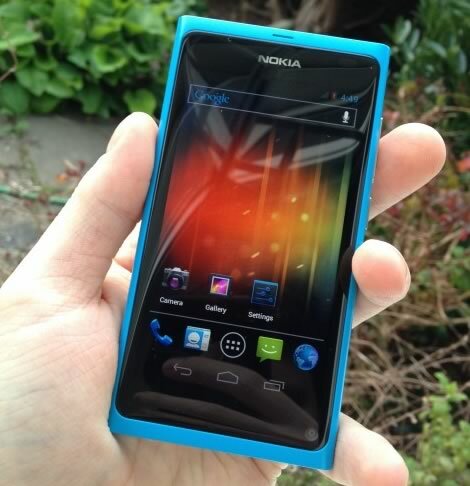 The port even allows Nokia N9 owners to dual-boot between MeeGo and Android 4.0.3. For an early release, this is a pretty solid port with most functions like multi-touch, audio, video playback, 3D acceleration, GSM/3G, USB and Bluetooth connectivity working properly. The port does have some issues, with YouTube playback being choppy and the power/battery icon not updating. The N9 is a good fit for ICS since it has no front buttons and it houses a pretty solid 1GHz OMAP3630 processor behind that Gorilla Glass-covered 3.9-inch 854×480 pixel AMOLED screen. If you have a Nokia N9 and are anxious to try it out, head over to Nitdroid here and follow the instructions to grab yourself some dual-booting Android 4.0.3 Ice Cream Sandwich. Considering that most Android devices are still running an older version of the OS, N9 owners should be in pretty good spirits.